Is there a minimum booking for an entertainer or face painter? Yes, for birthday parties, there is a 1 hour minimum for Manhattan, and a 1.5-hour minimum for most other areas. For corporate events, there is a 2-hour minimum. time or an additional performer. How far in advance should I book? As early as possible. Our face painters & entertainers are quite popular and book up well in advance. To ensure that availability, please book early. For last-minute bookings, we make every effort to accommodate if at all possible! What kind of face paint do you use? 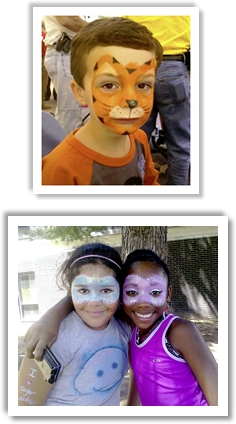 We use top-of-the-line, non-toxic, high-quality, FDA-approved professional face paint applied with a brush. The glitter that we use is cosmetic-grade with rounded edges, made for face painting. Do you require a deposit? Is it refundable? We require a deposit to hold your date and time. deposit for each entertainer or time segment cancelled is NON-REFUNDABLE. Deposits can be made with a Credit Card. How do I pay the balance? The balance is due 4 business days before the party by CREDIT CARD payment. What kind of set-up do you require for face painting? Each face painter requires table space and two chairs per painter. If the event is outside, we ask that the face painter be IN THE SHADE, as face paints will melt in the sun, and it is much more comfortable for the children. For balloons no table is needed, but SHADE is always best if outside, to prevent popping of balloons. What happens if my guests arrive late? The entertainer must begin and end at the scheduled time. Additional charges will be added for overtime or late starts. Can you accommodate both boys and girls? Yes, absolutely! We offer amazing face painting designs for both boys and girls. All character and princess shows are expertly crafted to capture the imagination of both boys AND girls.